I don’t want to tip my hand, since I haven’t even written the first draft yet much yet submitted my tale, but I thought you might like a brief introduction as to how a story is born. It’s born with an idea. I can’t really tell you what that idea is specifically, because it would give too much away, but I’m sure what I wrote in the third and fourth paragraphs gives you plenty of clues. But you ask yourself the question “What if?” and then take it from there. Turns out there’s a lot to developing that little “what if” and I nearly gave up more than once and moved on to another idea. However, this is a particularly compelling idea and I didn’t want to let it go. Artificial Gravity is pretty necessary for my story, so answering that question would go a long way to developing my tale. But I needed a complete spaceship, so I had to create one. I had specific requirements, some of which you already know, but in order for me to move my protagonist around in the ship, I had to know how it was laid out, how it worked, where it was, how fast it was moving, where it came from, and where it was going, and that’s just for starters. 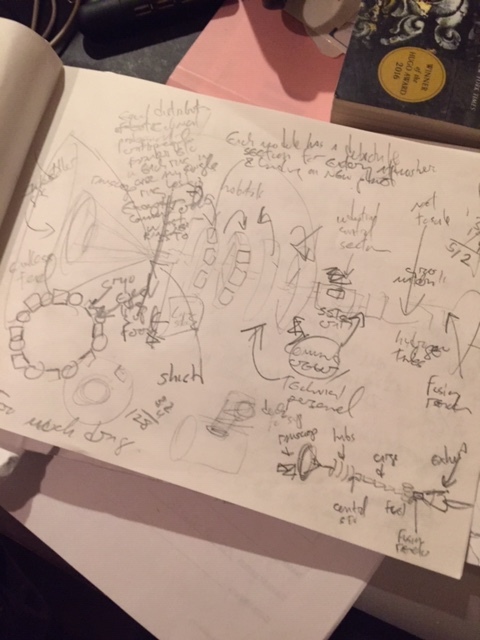 I’m showing you some of my rough sketches so you can get an idea of my process. No, none of these are meant for publication. 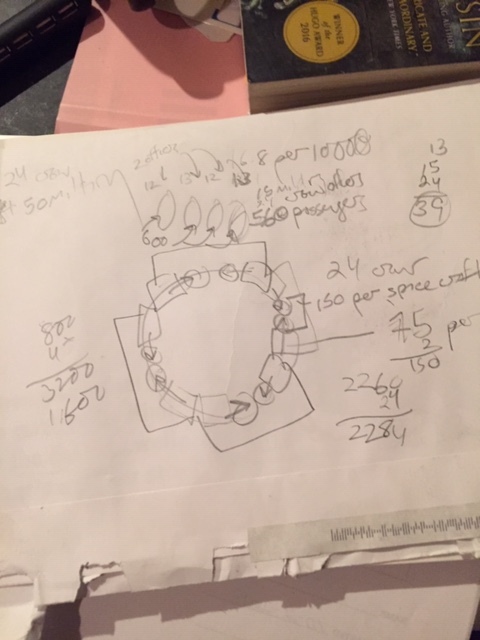 They’re meant to give me a visual guide of how to answer the questions above, plus providing a map so that when I say so-and-so went from here to there, I can describe the scene and actions as they logically should occur. After I created my chicken scratchings drawings, did a bunch of Googling, a bunch of “loose math,” looked up a bunch of names on a “random name generator,” and then I had to look up jobs. I found several lists of spacecraft related positions and crunched them into a mash-up to give my main character and the rest of the crew (living and dead) job titles on the ship. I also had to look up why a number of other people were on board as well, including their vocations. 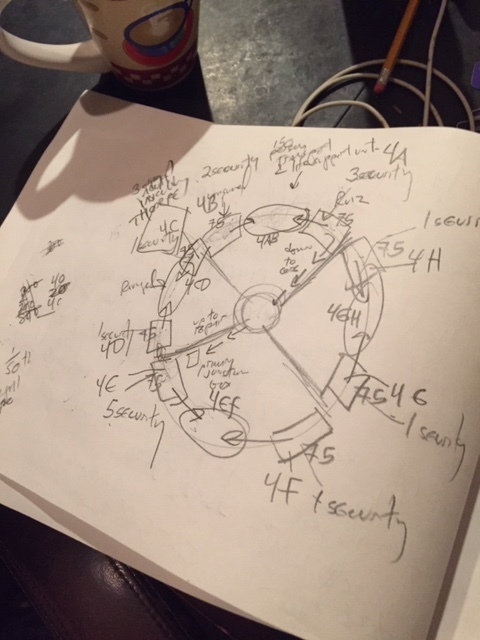 I not only had to design the exterior of the ship, but the interiors as well, especially the habitat rings, but also the controls structures, and anyplace else my protagonist might visit to makes sure I had a bunch of creepy sets in which to place my scenes. I found a type of bullet that would be “safe” to fire aboard a pressurized spacecraft, as well as a ton of hazards in shooting a conventional pistol or rifle in a weightless vacuum (assuming you could fit the finger of a spacesuit glove through the trigger guard). Once all that was in place, it was finally time to develop the plot. I needed to know how all the main action sequences would go before writing even a single word of the narrative. It took a while to go through it. I plotted linearly from the beginning, with only a vague idea how the story would end up, and thereby hangs a tale. I created an ending. This is a horror story, with a proper horror story climax…but I wasn’t satisfied, even once I went to bed Sunday evening. It kept bothering me. I woke up several times with the ending rolling around in my mind. Finally, I got up way earlier than I intended to and wrote an alternate ending, which extends the story by a significant bit. I only have a maximum word count of 9,000 to play with (officially, a short story is anything up to about 7,500 words, and between 7,500 and 17,500, it’s a novelette). After that, I was able to go back to bed and salvage what little additional sleep I could before waking up to start the day (while it was still dark). Now, I have to actually write the thing, but I’ve got two short stories ahead of it in the queue, both due on January 31st. They’re both in the hands of my beta readers and I’ve already been receiving some feedback and doing some editing. 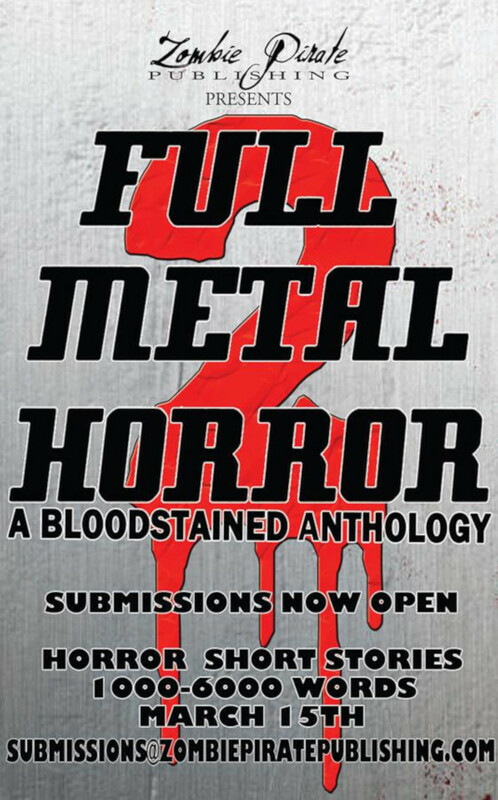 The “Full Metal” story is due March 15th, but yesterday, I discovered another anthology that’s just opened up submissions that are due…on March 15th. I have several stories that might fit their requirements, and have tentatively selected one, but it will take some development. But then again, I have two months. After that, the next story I plan to submit is due April 1st. I have something in mind, but again, I’ll have to revisit it and see what needs to be changed. Yes, it’s an involved process, but it’s also a lot of fun. Oh, keep in mind that what I’ve described above is just the abridged version. There’s a ton more that goes into this whole process.